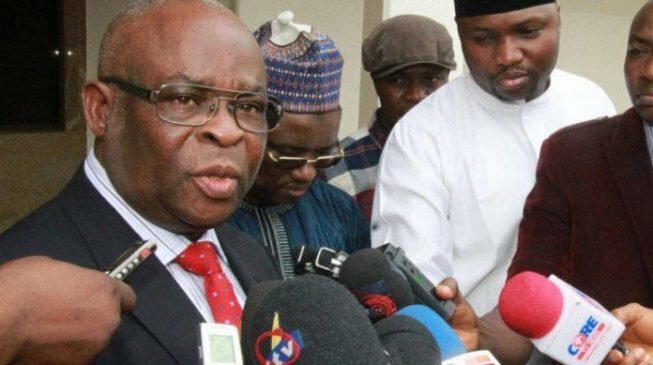 Walter Onnoghen, suspended chief justice of Nigeria (CJN), has asked Danladi Umar, chairman of the Code of Conduct Tribunal (CCT), to hands off his trial. Onnoghen asked Umar to withdraw from presiding over his trial on the grounds of “real likelihood of bias”. He described the CCT chairman as the “prosecutor, judge and jury who has constructively convicted” him without either hearing from the defendant or his being formally arraigned before him. According to The Nation , he made the submission in a motion filed before the CCT through his lawyers, while responding to a directive by the CCT chairman, asking him to appear for trial. Onnoghen, who is being prosecuted by the federal government on alleged false assets declaration, is yet to appear before the CCT since his trial began in January. He also described Umar as a “tainted arbiter” who is being prosecuted by the Economic and Financial Crimes Commission (EFCC) for alleged bribery. “The honourable tribunal, especially the Chairman, has constituted himself as the prosecutor and accuser of the defendant/applicant and cannot in good and clear conscience continue to be part of the proceedings and trial of the applicant,” the motion read.